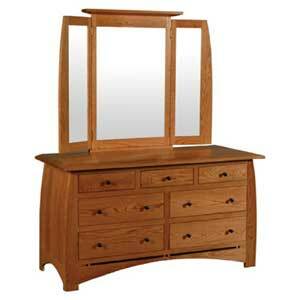 It doesn't get more beautiful then furniture made from hand with a carefully applied finish. 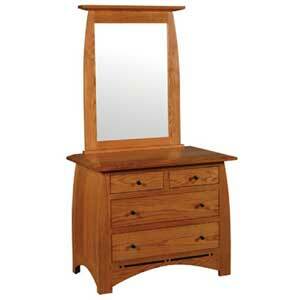 This decorative bedroom bureau and mirror set will serve homeowners well as an ample sized dresser. 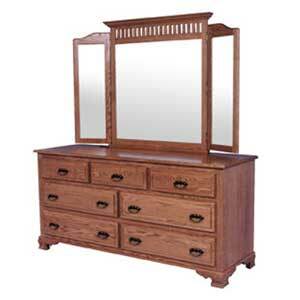 Made with solid Northern wood with the care and quality of Amish craftsmanship, this furniture piece is sure to maintain its beauty and quality for years to come. The sides of the piece feature an elegant planked design and the base rail has a decorative trestle bridge accent that is adorned at its peak with a hardware motif. Industrial themed drawer pulls complete this 9 drawer dresser with a forged look that is elegant yet rustic. 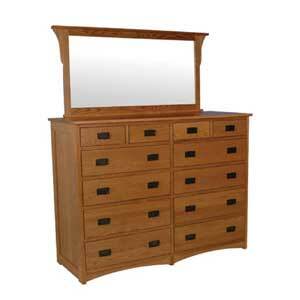 This piece also features "whisper" close drawers. A high end mechanism that allows a drawer to pull itself shut, safely and quietly, after just a simple push from you. The B and O Railroad Trestle Bridge Bureau and Mirror with 9 Drawers by Simply Amish at Mueller Furniture in the Lake St. Louis, Wentzville, O'Fallon, MO, St.Charles, St.Louis Area, MO Furniture Store and Belleville, Shiloh, O'Fallon,IL area. Product availability may vary. Contact us for the most current availability on this product. Finish & Paint Options Available in an assortment of finish options. Check with your retailer for availability. Handles & Hardware Railroad inspired pulls and knobs for an industrial look. Case Detail Bent beam bottom rails add decoration to many of the pieces in this group. Mirror Designed with the same simple style as the rest of its collection, this mirror stays elegant with a solid wood frame and hand applied finish. 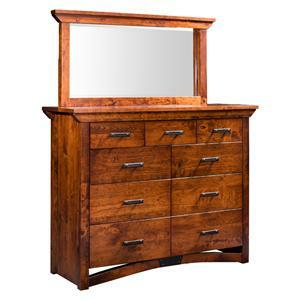 This mirror is ideal for homeowners who seek a classic looking dresser, finishing primping in their room or who merely want a bit of reflective light. Storage 9 storage drawers provide this piece with various options for tucking away clothes or other bedroom accessories. 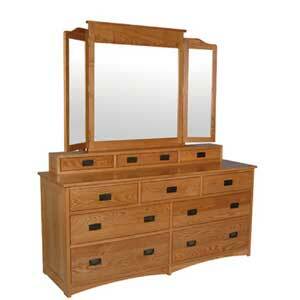 Description: Top Most case tops in this collection feature a planked finish for the finest in quality details. 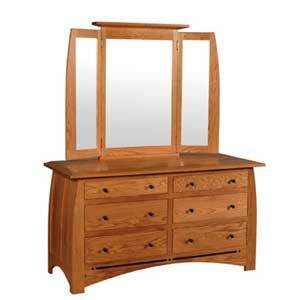 Case Construction Made of solid Northern hardwoods that are responsibly harvested to ensure the highest standards. The B&O Railroad collection will take you back to a simpler time. Where families gathered together at the end of the day to enjoy a meal that was made with their hands. 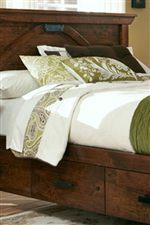 Using solid wood materials that are obtained in the most eco-freindly manners around, this collection features the handmade beauty that the Amish craftspeople are known for. 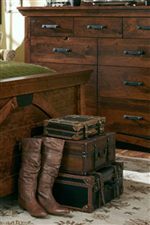 With carefully applied finishes and hardware that looks like it was forged from pieces of the original great railroad, this collection will help transform your living space into your home. 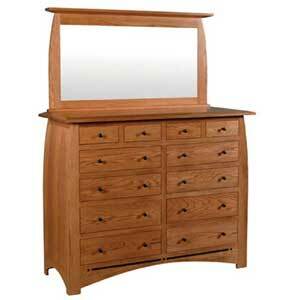 Each piece in this collection is fully finished, from the drawer exteriors to their interiors. Drawers feature "whisper" close hardware, a mechanism that will pull the drawer shut safely and quietly after you give it a push. Most items by this manufacturer also come with a hidden signature on the piece's back, belonging to the craftsman who built the piece. The B and O Railroad collection is a great option if you are looking for Mission furniture in the Lake St. Louis, Wentzville, O'Fallon, MO, St.Charles, St.Louis Area, MO Furniture Store and Belleville, Shiloh, O'Fallon,IL area. Browse other items in the B and O Railroad collection from Mueller Furniture in the Lake St. Louis, Wentzville, O'Fallon, MO, St.Charles, St.Louis Area, MO Furniture Store and Belleville, Shiloh, O'Fallon,IL area.